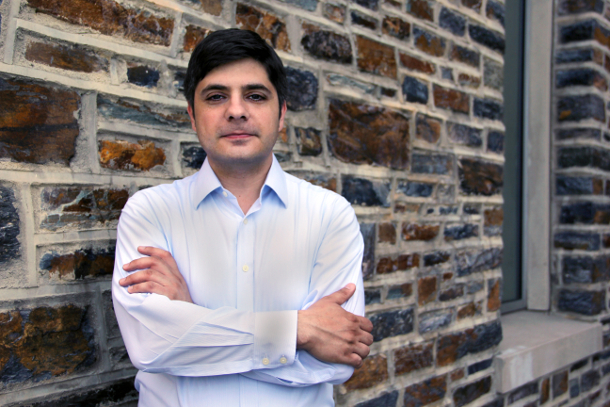 George Konidaris, a specialist in artificial intelligence and computer science, joined the electrical and computer engineering department in Duke University’s Pratt School of Engineering on September 1, 2014. With a dual appointment in the department of computer science, his research will focus on reinforcement learning, mobile manipulation, intelligent robotics, and effective learning and planning for control in unstructured environments. One of the more amazing feats the human brain can accomplish is automating and coordinating the thousands of minute decisions that allow us to go about our day-to-day lives. We can catch a ball out the air or operate a car without having to concentrate on the dozens of required individual muscles, movements, and corrections. Robots aren’t so lucky. To complete even the simplest tasks, they must go through lengthy algorithms laced with alternative options that, no matter how many are available, tend to break down in novel situations. Program a robotic arm to open a door with a knob and it’s unlikely to also figure out one with a push-button handle. Konidaris began his career by earning an undergraduate degree in computer science and computational and applied mathematics from the University of Witwaterssand in Johannesburg, South Africa, which is also where he grew up. He then completed a master’s degree in artificial intelligence from the University of Edinburgh before moving to America to work on a doctoral degree in computer science at the University of Massachusetts Amherst. Konidaris completed his PhD in 2010 with a project that provides a good example of the work he does. He created a robot that had to learn tasks like pushing a button or pulling a lever even though it was only programmed with small movements. It learned to complete a task through trial and error and then analyzed which movements were important to completing the task, which it remembered for future reference. Faced with a similar task, the robot was then able to draw from its previous experience and figure out the correct series of movements much more quickly in subsequent trials. After completing his thesis, Konidaris took up a position as a postdoctoral researcher at the MIT Computer Science and Artificial Intelligence Laboratory, which is where he remained until joining the faculty at Duke. Konidaris says he was attracted to the university after having met several faculty members at various conferences. He looks forward to collaborating with them, as well as with several other new faculty members who are beginning to build a critical mass in robotics at Duke.